Female Urology:A Practical Clinical Guide offers a hands-on reference for the management of challenging disorders of the female lower urinary tract. This volume features scenario presentations in which a patient presentation is described and followed by two experts in the field reviewing work-up and management of the problem. The volume is divided into three, easy-to-follow sections. The first section, Evaluation, details the anatomy of pelvic support, the lower urinary tract, incontinency, and overactive bladders. The second section, Treatment, outlines treatments for stress urinary incontinence, overactive bladder, prolapse, and reconstruction. 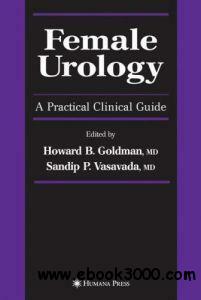 The third section includes case studies from various locales around the country, illustrating the proper techniques for the evaluation and treatment of problems relating to female urology. A thoroughly comprehensive and innovative volume, Female Urology:A Practical Clinical Guide will be of great use to busy clinicians striving for the most current methods of evaluating and treating dysfunctions in female urology.